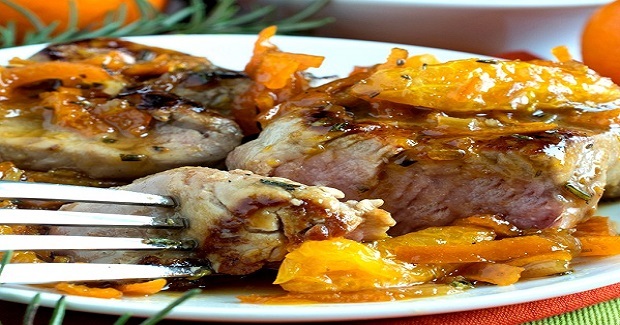 Mandarin Pork Tenderloin Medallions Recipe - Gutom Na! Posted on Wednesday, March 8th, 2017 at 2:20 pm. In a medium sauté pan, melt butter over medium high heat and add onions. Sauté for 4-5 minutes or until soft and starting to turn brown. Reduce heat to medium. Add rosemary and garlic and cook one minute. Add Balsamic vinegar and mustard and stir to combine. Add Mandarin Marmalade, stir and remove from heat. Peel oranges and with a sharp knife, cut out each segment of each orange and place in sauce. If you cut down on each side of the segment from the outside with a very sharp knife, the segments pop right out. Then discard the pith and skin. Remove silver skin from tenderloin and cut off a few inches of the thin end. The remaining piece should be somewhat the same thickness throughout, give or take. Cut it into four equal slices. Then cut half way to three quarters through each slice and butterfly open. Oil, salt and pepper each side of each butterflied piece. Place a large sauté pan over high heat and heat to smoking hot. Place all four pieces in the skillet not touching. Also cook the tail piece you cut off for nibbling. Cook for about two minutes and flip. Cook two more minutes and reduce to medium. Cook for another few minutes turning over one more time until cooked to your desired doneness. Ours took less than eight minutes total but we like it slightly medium rare. Use the poke test. Make a loose fist and feel the thick part of flesh below your thumb. When pushed, it is firm but has some give to it and bounces back when touched. The meat should have that same feel and be medium to medium rare. Remove to a platter. Keep the heat on and add the wine and after 30 seconds, add the reserved sauce. Gently stir trying not breaking up the segments. Add any liquid from the platter with the pork, stir in then pour over the cooked medallions and serve.